So your last board split in half and it’s time to invest in a new one – great! But with so many options available, it can be a real nightmare to set the record straight on which kind of cutting board is really worth your consideration. The most popular models on the market are made of either plastic, bamboo or wood. For a long time, plastic boards rained supreme because they were thought to be the most sanitary. However, recent studies have actually found very little difference in the amount of bacteria present on the surface of properly cleaned boards made of any material. Plus, plastic is easily scratched and unforgiving on your knives. Bamboo boards tend to be the least expensive and the most environmentally friendly. Unfortunately, they’re also the most prone to cracking and the surface doesn’t have enough give to prevent dulling your knives. Our choice at home and in the test kitchen? 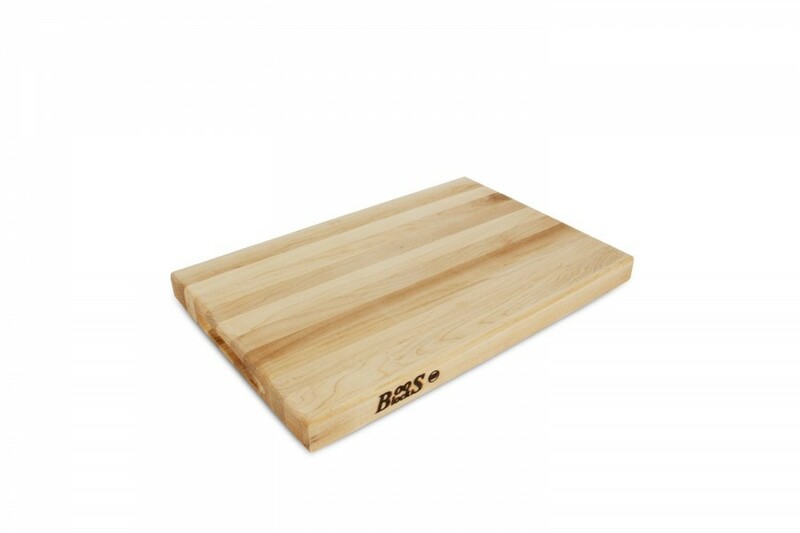 Wood cutting boards – they’re beautiful to look at, won’t damage your blades, and are extremely durable. Check out the John Boos 18 inch maple cutting board: if you hand wash it and rub it down regularly with food grade oil, it’ll last you for years.